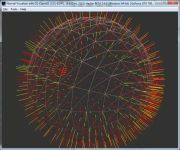 The surface deformer has shown that the fact to transpose the algorithms from CPU to GPU is beneficial to the computing raw power but often requires re-examining some parts of the algorithms because of the particular nature of the vertex and pixel processors. In the case of the normal vector calculation, the solutions can be simple (twist) or more complex (surface deformer). Subject 5.27: How do I transform normals? *** These source codes require Demoniak3D to run properly. *** These projects are part of the RaptorGL SDK. RaptorGL SDK is available here: [:: RaptorGL 3D Engine ::]. Page generated in 0.002377986907959 seconds.